Savoy Hotel Boracay is a 4-star hotel nestled at the heart of Boracay Newcoast. It stands as a perfect complement to an expansive stretch of which sand beach, clear blue waters and breathtaking views. It is part of the 150-hectare master planned Boracay Newcoast township that will include hotels, low to mid-rise condominiums, a residential subdivision, and commercial spaces spread out over a 60-hectare area, and will keep 90 hectares open. Designed by Singapore-based FB Eye, whose diverse portfolio includes luxury resorts, restaurants, spas, and private residences. In Savoy Hotel Boracay, it is our commitment to connect with our guests in the most unique, personalized and experiential way that they feel pampered and delighted from the time they inquire, until they check in, in the course of their stay, and until they leave. Our goal is to excite our guests’ five senses to create a long and lasting emotional bond that will last them a lifetime and even more,” says Adie Gallares, Savoy General Manager. Sitting on a 1.8-hectare land area, Savoy Hotel Boracay has 559 well-appointed rooms with spectacular views of the island. It has four roomcategories, deluxe, corner deluxe, premier deluxe and executive suites, and 40 connecting rooms. It is a six-story hotel with a main swimming pool, meeting room and function room. A fitness center awaits the active bodies while a spa provides a welcome respite for everyone. For business matters, fully equipped meeting rooms are available anytime. Savoy Hotel has three dining outlets, Savoy Café, Vienne Lobby Lounge and Chambery Pool Bar. It is open to offer guests the best food and drinks. Savoy Café, a sophisticated dining café offers a contemporary cuisine and is open to serve you all day. It can seat 120 people and 80 people outside by the pool. Vienne Lobby Lounge serves cold sandwiches, tapas, drinks and pastries. The Chambery Pool Bar, embedded in the main swimming pool, can seat up to 30 people. 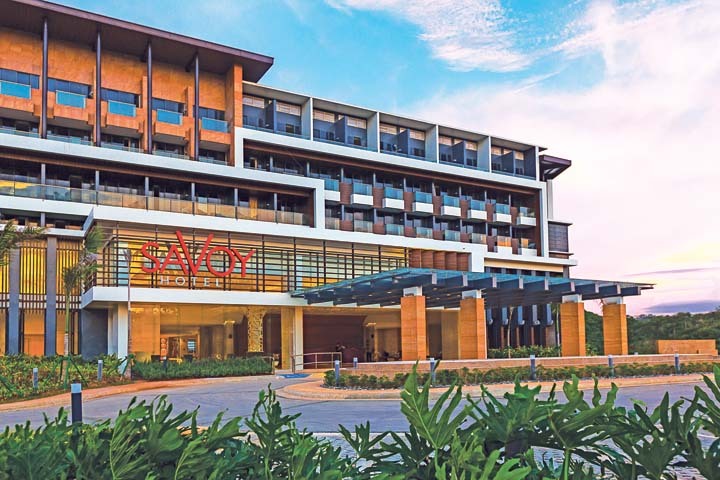 Savoy Hotel Boracay also has a ballroom big enough for up to 120 guests. Surrounding the hotel is a huge party pool, the first and only concert pool arena in the country, open to the public for events, parties and concerts. Boracay Newcoast has three coves and Savoy Hotel is a 10-minute walk to the Newcoast Beach Cove 2, a 295-meter of white and powdery sand beach stretch with a private feel and relaxing ambiance. There are golf carts and shuttles to take guests there. Situated northeast of the island, this 150-hectare development will surely attract more tourists in this exclusive North Eastern part of Boracay. Experience and enjoy a luxurious beach lifestyle with various leisure and water activities right at your fingertips. A vibrant and hip place with a contemporary beach lifestyle that defines a world of its own. Enjoy the sun, sand and sea and get to color your experience only at Savoy Hotel Boracay. Savoy Hotel Boracay is located at Newcoast Drive, Boracay Newcoast, Brgy. Yapak, Boracay Island, Malay, Aklan and is developed by Megaworld Corporation in partnership with its subsidiary GERI (Global-Estate Resorts Inc.).